Layers of cornbread, enchilada sauce, spiced ground beef and cheese, baked until melty and topped with all your favorite taco fixings! Whisk together cornmeal, flour, sugar, baking powder, and salt. Add oil until soft crumbles form. Whisk in milk and egg. Gently fold in chiles and corn. Pour into greased baking pan (9x9, 9x13, large cast iron skillet). Bake until set (a toothpick should come out clean), about 20-25 minutes. While cornbread is baking, combine beef with spices and sauté in a skillet over medium heat until fully cooked, about 10 minutes. Drain and set aside. Once cornbread is done baking, reduce oven to 350 degree F. Poke holes in cornbread with a fork and pour enchilada sauce over it. 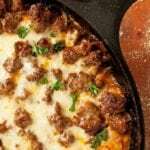 Top with ground beef and shredded cheese, and cover with aluminum foil. Bake in oven for 20 minutes. Remove foil and back until cheese begins to brown, about 5-10 minutes. Let cool for 10-15 minutes before serving with desired toppings.